There’s a few things that might surprise you about Uluru. Its sheer size for one - it’s taller than the Eiffel Tower (348 m) and 9.4-km around; a colossal mass of burning red hovering amidst endless plains of nothing. There’s magic in the way it catches light, glows, pales, throws red, purple, iridescent orange – like an ever-evolving work of art, changing with the sun. But more surprising than its physical majesty is its cultural gravitas. 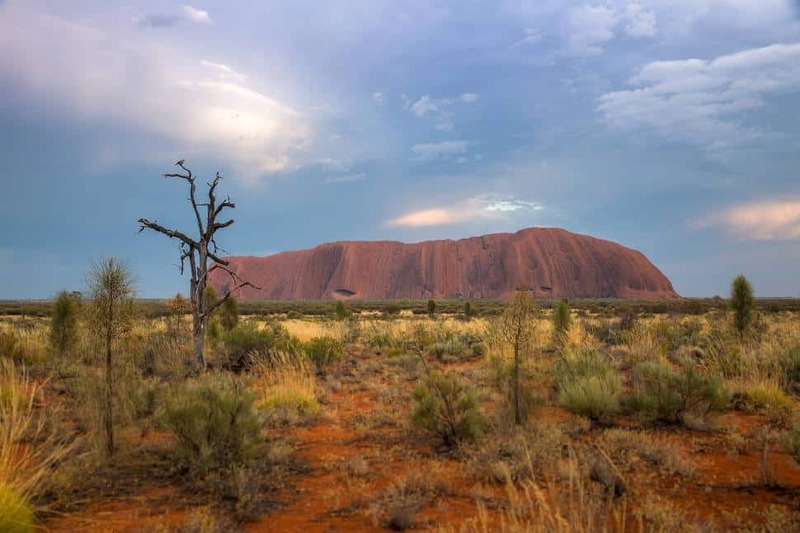 Uluru was formed 600 million years ago, and Australia’s Aboriginal Anangu people have inhabited the region for more than 30,000 years. Australia has an old soul, and Uluru is truly its beating heart. What won’t surprise you is how infrequently it rains here. Uluru sits in the centre of a semi-arid desert. Rain at the rock is a rare thing – it only sees around 300 mm each year. The local Anangu people don’t follow traditional Western dates and seasons. One of the local elders, Barbar Tjikatu (who received an Order of Australia in 2006) described it this way: “We only go by our own seasons…we know which fruits and foods we get during our seasons – that’s what’s important to us.” There’s Piriyakutu (usually around August/September), the time when the warm, steady piriya wind blows over to the plains, and the animals begin to breed. Or Itjanu (usually January to March), when the rains and heavy clouds come and soak the sand, causing wildflowers to bloom. Rain during Itjanu is still a rare thing, but as it happens, it’s a rare thing I happened to witness. I arrived in the outback ready to embark on my 3-day Uluru Adventure with Intrepid Travel, set to explore one of Australia’s most iconic sight - akubra in hand and some Aussie meat pies under my belt. There were a few things I anticipated - the heat, the alien beauty, the rich cultural heritage, the delight of a cold beer after a long day. What I didn’t anticipate was a wild storm in Australia’s famously dry Red Centre. We’d crawled into our swags after a typically sweltering outback day. I lay sprawled on top of my sleeping bag, exposed to the elements but for a blanket of stars. A bolt of lightening broke my dreamy reverie, and gathering storm clouds blew in fast, blotting out the Milky Way. I held my ground when the first few drops fell; a blissful reprieve from the oppressive heat, but the drops soon became a downpour and my swag a sinking ship. We dashed for our tents, dragging our sodden sleeping bags behind us, and slept while the storm raged on. When we woke before sunrise, the rain had cleared. But the parched earth had become a slick of wet red. Our boots became muddied as we walked Uluru’s circumference, but far from spoiling the experience. This rare downfall made the whole thing kind of magical. 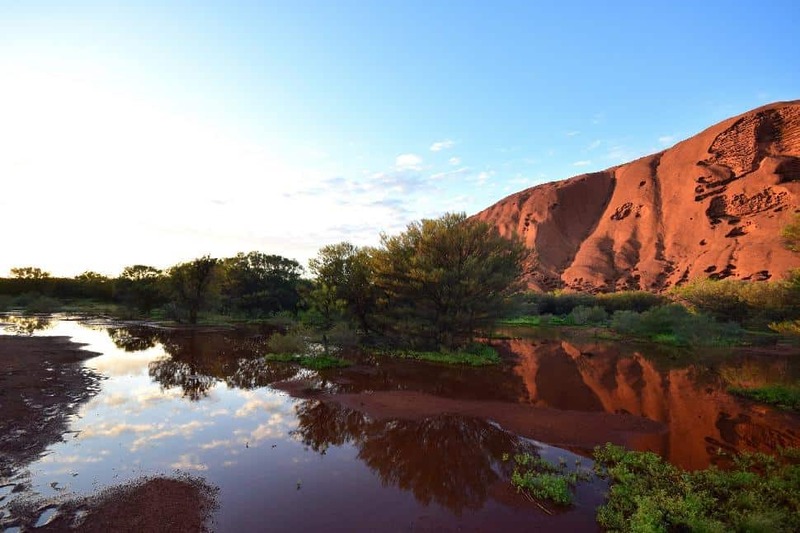 The sun rose and pools of water began to glow in the morning light, reflecting Uluru in all of its fiery glory. The puddles were like windows into the earth’s core; apparently 2.5 kilometers of Uluru’s bulk actually lies beneath the ground. It turns out this pooling water is part of Uluru’s power, on the rare occasions it rains, water gathers on top of the rock and funnels down the sides to its base, where it falls in concentrated regions and permeates the soft sand. This ensures there’s a constant supply of water around the rock (save for severe droughts) to feed native plants and create nourishment for the land’s people and animals. It is a giver of life in the middle of a relentless desert. We walked three hours around the rock in the early morning light, hearing Dreamtime stories about every ancient painting, cave and crevice, and learning about the plants that dot its base. There’s native figs, finger limes, bush plums - bushtucker is plentiful if you know where to look. And there’s stories etched into every corner of the rock, lessons to sustain life. It seems the more you learn about this place, the more respect you gain for the monolith itself and its traditional owners. The way the Aboriginal Anangu people have nurtured and learnt to live harmoniously in this hostile environment is enlightening – it is the ultimate show of sustainable living. Everything has a place, a reason and a story. Stories that truly come to life when you’re exposed to the full wrath of Mother Nature - it turns out being rained out of my swag was the best thing that could’ve happened.